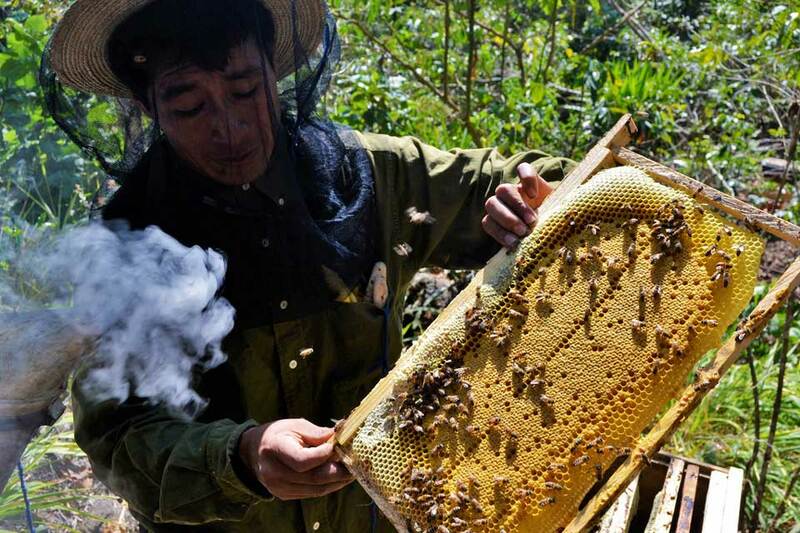 On a hot, humid Sunday morning nine men and women beekeepers hiked the slopes Lake Atitlán’s Volcán Tolimán to tend small boxes quietly buzzing in a forest clearing. Wearing a veil, jacket, and gloves over her traditional huipil and skirt, Felipa Ajcalon Sajquiy, president of the Pampojila beekeeping association, stands by as apiculture technician Genaro Cuj lifts the lid off the first box with his bare hands, revealing frames full of honeycombs and bees. One of the trainees—all coffee farmers from Totolya—pumps smoke into the box to calm the bees while Genaro carefully inspects each frame. “This hive is healthy,” he says, pointing out the formation and clusters of bees to the trainees as bees swoop, buzz, and circle their veils and hats. Felipa laid a baggie full of sugar-water and lime juice in a bowl on top of the frames to feed the bees and keep them disease free, then Genaro recovers the box and moves to the next hive. Beekeeping in Guatemala and Mexico dates back to the ancient Maya, who kept the stingless bees (Melipona beecheii) symbolized by the god Aj Muzen Kab’ in the Mayan “Madrid Codex.” But in today’s world, most of the Kaqchikel coffee farmers in the Totolya group had never considered beekeeping until the coffee-rust disease, Roya, destroyed crops on their smallholder farms, wiping out most of their annual income. In the face of that crisis, in early 2013, community members formed the first beekeeping group piloted by Pueblo a Pueblo, a U.S.-based nonprofit organization working in the Lake Atitlán region. The project, initiated in Pampojila community on Volcán Atitlán, gives smallholder coffee farmers a sustainable additional source of income to help them provide for their children. “We chose beekeeping because it’s relatively simple. 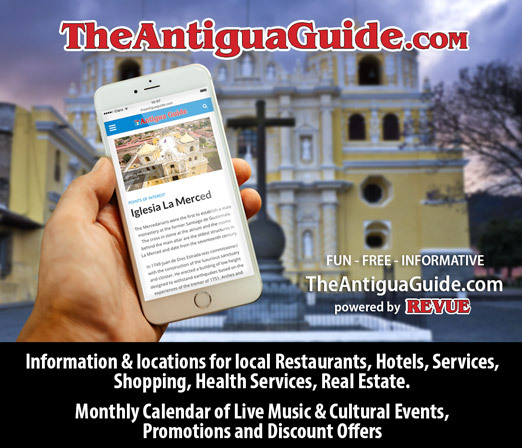 It doesn’t require a lot of special tools and doesn’t take much time,” says Pueblo a Pueblo’s executive director Rosemary Trent. Although the project focuses on beekeeping and honey production, it also teaches transferable skills like management and teamwork, accounting, price setting, marketing, and investing for future growth. Like most of the five women and four men in the pilot group, Felipa had no previous experience with apiculture (beekeeping) when she joined—she only knew that, as a widow raising five children alone, it may be the only way she could afford to keep her children in school. But Genaro, who had worked with bees since age 10 in family apiaries, trained the team in everything from bee castes and life cycles, diseases, hive construction, site analysis, and more. The group named itself “Aj Tikonel Kab’,” Kakchiquel for “harvester of honey,” and by the time the hives arrived in May 2013, the group hit the ground running. But first, they had to start hiking. Group members carried each of the ten 30 lb. hives full of bees on their backs up the steep slopes of the volcano. Although the ancient Maya raised “stingless bees,” that breed tends to be a poor honey producer, so the hives contained a better-producing Italian breed, which, while not aggressive, does indeed sting, so the group always wears protective clothing. Genaro wears a veil and long sleeves as a good example for the group, but sees stings as part of the job. He never bothers to wear them when working with his bees at home. “I’ve been stung more times than I can count,” he says. Group members made the same trek up the volcano every four days or so during the rainy season, when flowers are less abundant, to feed the bees and check the condition of the hives. With each visit, the hives looked healthier, encouraging the group to dream of the rich harvest to come. That is, until the terremoto hit. 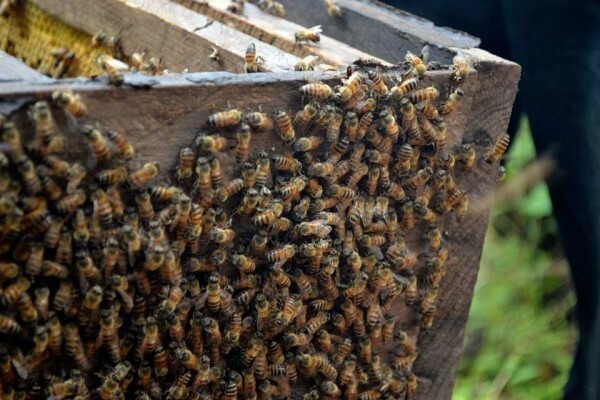 On September 6, 2013, a magnitude 6.6 earthquake rocked southwest Guatemala, it destroyed several of the hives, and many bees swarmed and fled. Although earthquakes are common in the region, Genaro had never experienced anything like it in 30 years of beekeeping, and the loss of the swarm threatened to ruin the entire project. 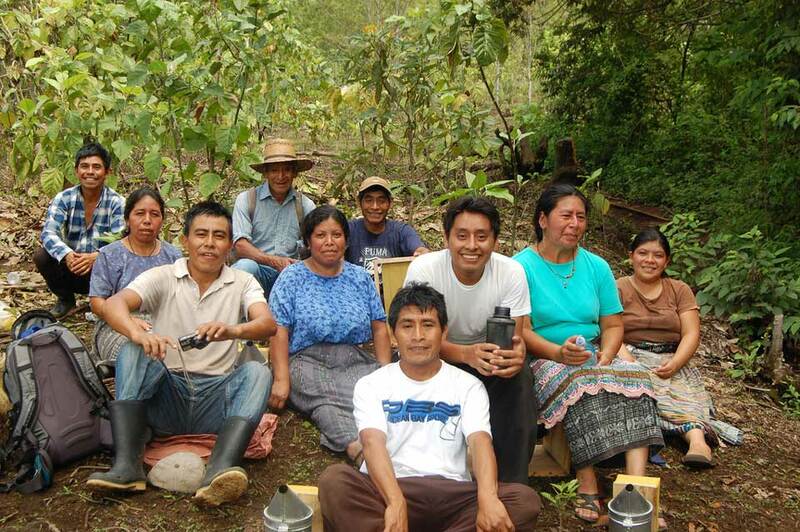 Genaro, Felipa, and the team refused to let their dreams of beekeeping be shattered. They reconstructed the hives and carried them even farther up the volcano to a new site, carefully securing them so they would be less likely to fall again. Soon two of the swarms somehow found their way back home, and by February 2014, the group had harvested and packaged more than 200 lbs. 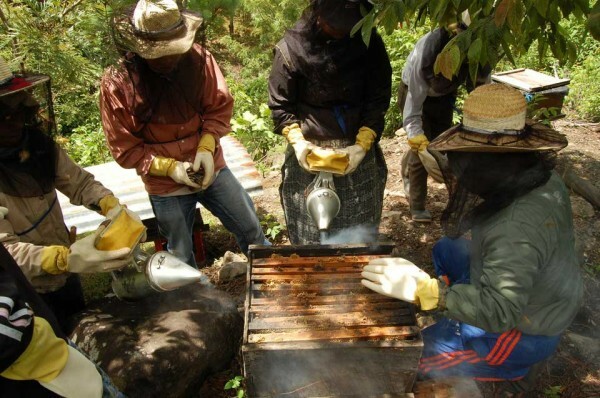 of honey to sell around Lake Atitlán, earning enough money to distribute to the group members while investing to expand the project. This is a wonderful article. Maybe Filipa can join a Friendship Bridge Trust Bank & receive a loan to help her expand her bee business! I absolutely do not agree with your comment in the Revue magazine on beekeepers of Toliman. If you want to help them, the worst thing to do is to encourage them to take a loan and be in debt. You’re probably an American,(perceiving your way of thinking) so it’s not your fault to think about financing and acquiring debts. You think that it’s a solution. 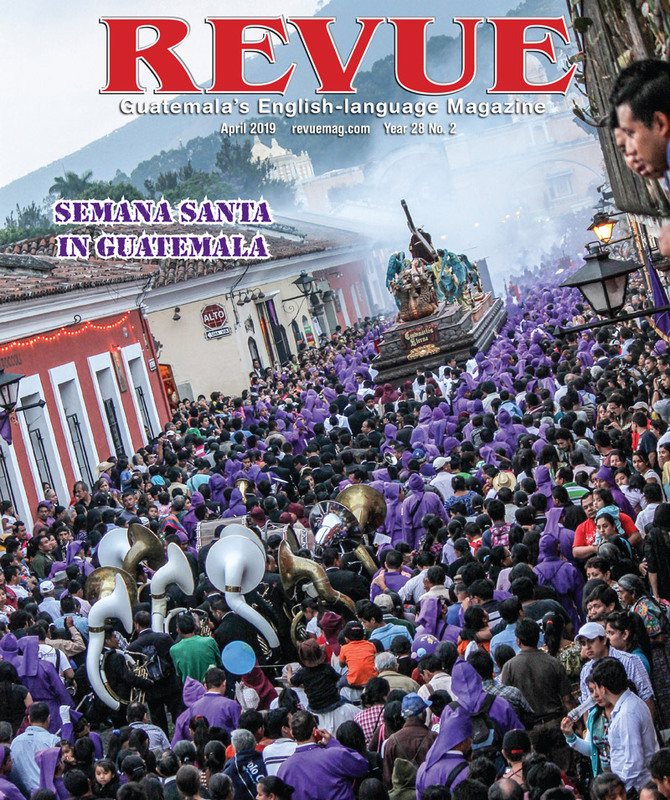 Ten cuenta (Realize) that the American way of life is not the Guatemala way of life. I live in Guatemala, and live with the Mayas and your recommendantion is an absurdity considering that one of their values is to be self-sufficient. The best way you can help them is 1- firstly buy their honey instead of buying pasterized honey from the grocery store. 2- Go help them,and learn about beekeeping; they need support. 3- You can give them money directly to them when you visit them. Please do not kill their values and be capitalistic. America is presently – poco a poco – destroying itself by its philosophy. Do not destroy these hardworking sincere in Guatemala. I have been keeping bees in the US for. About 15 years. I will be in Guatemala in March. Would like to catch up with you.